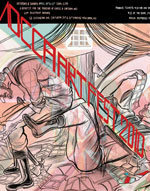 News / Top Shelf featured in three panels at next month's MoCCA Fest! Top Shelf featured in three panels at next month's MoCCA Fest! Hey fans, as if our awesome Swedish Invasion party and book launches weren't enough reason to make this year's MoCCA Festival a must, the festival has now announced panel programming for the show -- and Top Shelf is featured on both Saturday and Sunday! Saturday (April 10) will see Alex Robinson and James Kochalka included in an all-star panel of artists discussing their favorite comics of the decade. Then on Sunday (April 11), Top Shelf 2.0 editor Leigh Walton will join a host of folks talking about comics and new technology, and later a Scandinavian Comics panel will feature both Johannes Klenell and Mats Jonsson (Hey Princess), our friends from Swedish publisher Galago and key figures in the Top Shelf Swedish Invasion! Full details on the three panels are after the jump, or click here to see all the great programming lined up for the show. 4:00pm Best of the 00s: Artists On their Favorite Comics of the Decade Artists come together to celebrate their favorite graphic novels of the past ten year. Expect a lively discussion and lots of pretty pictures for this one. Featuring: Alex Robinson, James Kochalka, Becky Cloonan, and more. Moderated by: Douglas Wolk and Brian Heater. 12:45pm New Genres, New Readers, New Technologies: the World of Comics To Come Books, Webcomics, iPhone apps, minis–the choice of publishing platforms has never been greater. Featuring: Leigh Walton (Top Shelf 2.0), Liz Baillie, Craig Yoe, David Steinberger (Comixology). Moderated by: Calvin Reid (Publisher’s Weekly). 3:15pm A Scandinavian Comics Primer Representatives from Sweden, Denmark, Finland, and Norway join us to discuss the state of comics in their respective countries. Featuring: Johannes Klenell (Sweden), Mats Jonsson (Sweden), Espen Holtestaul (Norway), Ville Hänninen (Finland), Henrik Rehr (Denmark). Moderated by: Shannon O’Leary.